Is it possible to shoot an immersive 360 degree video and share it to YouTube or Facebook without spending money for a professional photographer’s rigging? Can make a 360 video without spending a lot of money on software? Up until recently the answer was NO. However camera manufacturers have finally figured out ways to deliver high definition video at a price that won’t hurt. Not only can you immerse yourself in virtual reality, but you can share the experience on Facebook and YouTube. You will now spend thousands of dollars less because you no longer need to use a professional’s multi-camera setup and high end software. Some companies streamline the process by hosting your images on a special website. For instance Bublcam will host your video or images on Bubl.io, their cloud storage service that allows you to upload, view and edit your media. The Ricoh Theta S images and video get uploaded to the Theta360 website. Beware, the Chrome browser seems to work the best when uploading to YouTube from this site. Other camera companies use a special app on your phone to convert the video and send it to the social sites. For instance, 360Fly has you send send the image to a 360Fly Director app. Once there, the share feature converts the video to a format that can be uploaded directly to either YouTube or Facebook. Make sure you sign in using your YouTube/Facebook information. Finally, there is the usual method of downloading the images to your computer first. Kodak PixPro SP360-4K camera comes with Windows and OS-X compatible software that converts recorded images into YouTube’s 360-degree format. What if you have several videos that you want to piece together to make a sequence? There is special post production video stitching software for that. This is especially good for the photography buff who wants to make custom immersive 360 degree videos. It also works exceptionally well when you have images from multiple lenses or multiple cameras. Video stitching combines lots of images that overlap so that you get a panorama or high resolution image. This is done with specific software that uses computer algorithms to produce seamless pictures from multiple videos. One of the more well known software is VideoStitch Studio. VideoStitch supports just about any high resolution camera. It has editing features that allow you to get the best out of your 360 degree camera rigging. Exposure and white balance sharpen the video image. Anti-vibration stabilization overcome the effect of holding the camera in your hand. Altogether this software allows the DIY-er to develop more creative formats and projects. Another well known software, particularly for GoPro users, is Kolor Autopano Video Software. This software uses your computer’s graphics card to develop the final video. It automatically synchronizes your different video streams so that the color and exposure are uniform. The two software platforms run with different engines but the way you work them is very similar. They are both great programs. Autopano may be a little easier to learn while VideoStitch has a better way to find control points and stitch. That said, you can’t go wrong with either software. 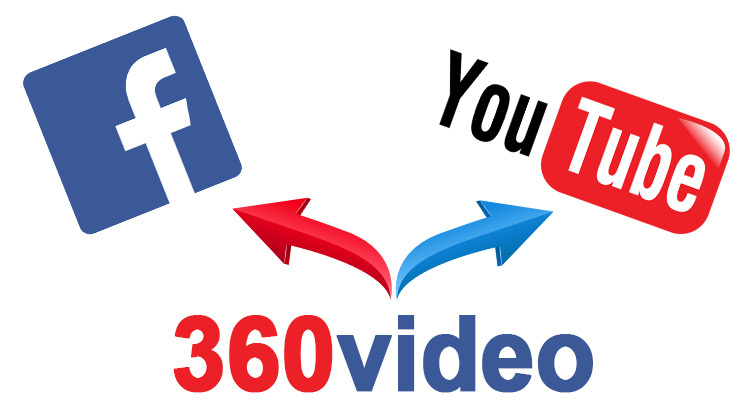 Let’s start by talking how to upload a 360 video to Facebook. Facebook limits the file to 10 minutes of video or 1.75GB of data. They also want you put in the 360 metadata that is needed in the video file. Some cameras like the Ricoh Theta S, Kodak SP360 or the 360Fly do this automatically. If your camera does not add the metadata, you will have to do it do it by hand. Download the 360 Metadata App for your PC or Mac. Unzip the file and open the app. Select the file, then make sure you check the Spherical box and click save. Enter a file name and save the file. All in all a simple process that is also intuitive. Your video will need to process before others will see it. To be able to watch 360 videos on YouTube you need the newest Chrome, Firefox, Opera, or Internet Explorer browsers. You will want toencode the video in high resolution. YouTube supports 360 videos with twenty-four to sixty frames per minute. They recommend a 16:9 aspect ratio. Those videos should also have a 4K resolution. Like Facebook, YouTube requires metadata for the 360 video file so that playback will be enabled. If the camera did not provide the metadata, then you will have to add it using a 360 Metadata App for your PC or Mac. YouTube recommends that you have 360 playback by first watching the file on your computer. You want to be sure you edit the video before you upload it. The Video Editor on YouTube and the enhancement tools don’t currently support 360 videos. As you can see, all the work has to be done beforehand. Then the uploading process is simple. However, t will take some time, depending on your internet connection and the file size. All in all camera companies have come a long way in enabling you to share your best images with your friends. Even professional photographers are finding that the process of uploading 360 videos is getting streamlined. Everyday enthusiasts will love tweaking their work and showing to their friends on social media. Either way, what used to be tedious process has now become a breeze. By using the 360 video cameras and stitching software, you’ll be able to sweep your friends into your immersive experience.